Our greatest accomplishment in year 2005 has been the establishment of a permanent legal global governing body: Global Community Earth Government (GCEG). GCEG has replaced the United Nations. We are now governing Earth and its human population on behalf of all life on the planet. Global Parliament has approved the Global Constitution which has now become our blueprint for operating and governing. Several Global Laws have been passed by Global Parliament and others are in the process of being studied. Help victims of hurricanes along the Gulf Coast, and victims of land slides, forest fires, tsunamis, earthquakes, and terrorist attacks. Help victims in all parts of the world. Contact the GCNA Emergency, Rescue, and Relief Centre. President Bush is a criminal and considered extremely dangerous by the Global Community Earth Government (GCEG). Extreme caution ought to be taken for his arrest. A representative body of the Earth Court of Justice may be set up anywhere for his trial. Governance of the Earth will make the rule of arbitrary power--economic (WTO, FTAA, EU), political (UN), or military (U.S.A. and NATO)-- subjected to the rule of law within the global civil society, the human family. Justice is for everyone and is everywhere, a universal constant. Earth governance does not imply a lost of state sovereignty and territorial integrity. A nation government can exists within the framework of an effective Global Community Earth Government protecting common global values and humanity heritage. Earth governance gives a new meaning to the notions of territoriality, and non-intervention in a state way of life, and it is about protecting the cultural heritage of a state. Diversity of cultural and ethnic groups is an important aspect of Earth governance. Earth governance is a balance between the rights of states with rights of people, and the interests of nations with the interests of the the Global Community, the human family, the global civil society. Earth governance is about the rights of states to self-determination in the global context of the Global Community rather than the traditional context of a world of separate states. Although Earth Government ensures state governments that it will obey the principle of non-intervention in domestic affairs, it will also stand for the rights and interests of the people within individual states in which the security of people is extensively endangered. A global consensus to that effect will be agreed upon by all Member Nations. The Global Community will continue to implement a total embargo on all U.S. consumer products, goods and services including mass destruction chemicals, nuclear war heads, weapons, war products and war equipment. The war industry throughout the world must be put to a complete halt and shelved forever from humanity. The Global Community is asking all peoples never again to buy U.S. products. Governance of the Earth will make the rule of arbitrary power--economic (WTO, FTAA, EU), political, or military (NATO)-- subjected to the rule of law within the Global Community, the human family. Sir, GCEG has shown that Justice is without borders. And so Justice is for everyone and is everywhere, a universal constant. You have been elected for a second term as President of the worst polluters on the planet and of a predator nation. During your campaign you have used religion, your religion, and its membership or supporters, to elect you. Ever since 9/11 the Global Community has fought your policies at home and abroad, and how your daily lies and brain-washing exercises have changed the American people to follow your lead. The use of the military has been abused to the detriment of human and Earth rights. The evil is the war industry. In the Sermon on the Mount, Jesus develops the ethic of nonviolence and love of the enemies. Early Christians were probably the first individuals to renounce participation in war unconditionally. "Blessed are the peacemakers: for they shall be called the children of God." And he told Peter, "All they that take the sword shall perish with the sword." Christ has taught us to show mercy, to forgive enemies, to put up patiently with oppression, to return only good for evil and love for hatred and, therefore, war is inconsistent with the Spirit of Jesus Christ. This shows that a Christian, a born-again Christian, or someone who believes in the evangelical teachings, should take no part in war, never, in any way. This all means that violence is futile in the long run. To respond to violence with violence is only perpetuating a vicious cycle of violence. "It is written : My house shall be a house of prayer, but you are making it a den of thieves." If Jesus was alive and here today He would disapprove of your war Sir. You are, along with the American people, those same people He chase out of His Church. "I am the Soul of Earth and of all that exists on Earth. My Temple is Earth! Not only are you thieves but you are murderers and killers. I know you all personally as your Souls are a part of me. They are my eyes. You cannot hide, and you cannot run Mr. President. I will not whip you out of my Temple as Jesus did for his. I have no need for that! You are destroying yourself. The only problem you are also responsible for the death of innocent and humble people. Life on Earth and the rest of humanity are threatened of extinction. This is insane! You have polluted air,water and land, and you are still creating conflicts and wars. Most often the innocent and the humble people are hurt or killed. I want you to put down your guns, all of you. You will recycle all your weapons, war heads and any war equipment and products. You will stop destroying the ecosystem of the Earth right now. You will start and help the grassroots process of the Global Community. Earth shall be a place of prayer and shall become a Heaven for Souls as it is for God. If us, Souls and God, can see life as the most precious thing ever created, and we see Earth as Heavens, why cant' you? After your physical forms are dead your Souls will leave Earth forever.The purging and renewing of the Souls on Earth will last a millennium." If you manufacture bombs, weapons of all types, war ships, war planes, or any other types of war equipment or products, directly or indirectly, and if you provide the services of wars, you voted for a leader (President Bush) who claimed wars(or conflicts) as a way or a solution to a problem or concern, and/or if you are a soldier, a war maker or doer, then your Soul is facing the Soul of Humanity right now. And good-bye Charlie! And good ridden! Have a good particle in empty space between the oldest galaxies of the universe, and you may keep it for another fifteen billion years! You will serve God right there after you die! You will never see the light again! Earth wants Peace in the world, and Earth shall have it. Because of a geographical or political border, or because of some cultural or religious differences, you could not live and learn to be at Peace with the community next to you, your neighbors. In a way terrorism is a self-inflicted injury to humanity by members of the human family. But then there are several other ways of inflicting harm to humanity by people often living in our own community. They make another class of terrorists. They are 'criminals in waiting' because they are seen as 'good guys' in our society. So far their actions have been categorized as acceptable by our society. When their behavior is filtered through humanity's newly acquired Vision of the world it suddenly becomes evident to most sound thinking persons that they are true criminals and should be prosecuted by the Earth Court of Justice. You are one of them Mr. President and so are most Americans. All of these people are "criminals in waiting" and will be prosectuted by the Earth Court of Justice. The invasion of Iraq is a crime against humanity. Ever since 9/11 the Global Community has opposed the invasion. We can read through your lies Mr. President. You have invaded Iraq to steal their oil and gas. That makes you a common thief. World oil and gas production will only last for another 30 to 50 years. You need the fossil fuels to feed the american economy, and the war industry (about 50 million Americans live off the industry directly or indirectly). Your energy needs are astronomical and largely wasteful. You have made the Middle East a hell. Why dont you go there instead of playing golf. Over its long past history trade has never evolved to require from the trading partners to become legally and morally responsible and accountable for their products from beginning to end. At the end the product becomes a waste and it needs to be properly dispose of. Now trade must be given a new impetus to be in line with the global concepts of the Global Community. You manufacture, produce, mine, farm or create a product, you become legally and morally responsible and accountable of your product from beginning to end (to the point where it actually becomes a waste; you are also responsible for the proper disposable of the waste). This product may be anything and everything from oil & gas, weapons, war products, to genetically engineered food products. All consumer products. All medicinal products! All pharmaceutical products! That is the new way of doing business! Per capita, the U.S.A. are by far the largest polluter on the planet. In year 2005, the US will be emitting 8.130 trillion kilogram of CO2 per year. Worldwide the total emissions will be 30.0 trillion kilograms of CO2. That is the US will be emitting 8.130 / 30.0 x 100% = 27.1 % of the total CO2 emissions. Now that the US is manufacturing cars in China we will see a larger increase of pollution due to the US technology being sold abroad. China wants its fair share of the oil and natural gas of the Middle East and of other areas on the planet. Applying the new way of doing business would make the US responsible and accountable of the CO2 pollution created by the car manufacturers in China (and in all othe nations) that use US technology and 'know how'. Carbon emissions coming from a car built in China using US technology and 'know how' are to be added to the US carbon emissions. We estimate that the emissions due to these new cars will create 0.20 trillion kg of CO2 to the atmosphere. Plastic, an all-around product the cause of wars and of a global environmental and social nightmare. The basic raw materials for plastic are oil and/or natural gas. These fossil fuels are sometimes combined with other elements, such as oxygen or chlorine, to make different types of plastic. Plastic does not recycle well due to the properties of its fibers, and if more than a small amount of recycled plastic is put into new production of plastics, the result is an inferior and unprofitable product. It is a fraud upon the public that the "chasing arrows" on plastic containers imply recyclability and recycled content. The types of plastics and varieties of containers that can actually be recycled are few. What's more, the plastics industry including soft-drink corporations have been let off from collecting or recycling their poisonous garbage. Apart from some lower-grade materials, such as park benches, carpets and some garments made from recycled plastic, utilization of recycled plastics is mostly a myth. Plastics made from plants, unlike petroleum-plastics, offer biodegradability which helps to relieve the problem of solid-waste disposal, but degradation gives off greenhouse gases, thereby compromising air quality. Plant-based plastics using fermentation are technologically simpler to produce than plastics grown in corn, potatoe, eggplant or other vegetables but they compete with other needs for agricultural land. However, beyond the threat to the environment and our health posed by genetically modified organism, the corporations – by engaging in agricultural strip mining for making biomass for plastics or alcohol fuels – would further degrade land that is already losing topsoil at a rate hundreds of times faster than nature normally would allow. Biodegradability has a hidden cost: the biological breakdown of plastics made from vegetables releases carbon dioxide and methane, heat-trapping greenhouse gases that international efforts currently aim to reduce. What is more, fossil fuels would still be needed to power the process that extracts the plastic from the plants, an energy requirement that we discovered is much greater than anyone had thought. After calculating all the energy and raw materials required for each step of growing plastic, it was discovered that this approach would consume even more fossil resources than most petrochemical manufacturing routes. Production of plastic from plants will inevitably emit more greenhouse gases than do many of its petrochemical counterparts. However, it appears that both emissions and the depletion of fossil resources would be abated by continuing to make plastics from oil while substituting renewable biomass as the fuel. However, how many million acres need to be planted to yield quantities of vegetable plastic for the global economy? We need to question the alleged socioeconomic needs of petroleum substitutes, and ask how many millions of people are supposed to use these materials for how many decades. But the bigger question is, don't people need to eat the potatoes and eggplant we can grow? The land needs to be used for other essential purposes, rather than growing plastic parts for unnecessary motor vehicles or kitchen equipment, for example. Monocrops are against species diversity. However, regardless of what people may wish as policy to satisfy their material wants, the energy to produce massive quantities of biomass for non-food purposes will not be available without abundant, cheap petroleum resources. Between years 2030 to 2050 the world will be running out of oil and gas. You might as well stop now thinking about sending astronauts to Mars. Are you promoting today your STAR WAR type system of defense because you know you will be running out of rocket and airplane fuels? At least the opposition to such a horrible project will get increasingly stronger in the coming decades. Whatever you do today you will eventually lose it all when fuels is scarce. What will you do when you have a space platform but no fuels to get there? Make fuels out of vegetables? You could but the American people wont let you no matter how big and strong is your army to protect the rich and wealthy American corporations. The enemy of the American people is not Saddam Hussain Mr. President. Killing Osama bin Laden and his people will not solve the roots of the problem that is, the Way of Life of the West and our values (or the lack of them) need to be reexamined. The enemy of the American people is you Bush, and the way of life you are supporting. The American way of life is extremely wasteful. By your behavior and ways of doing things, you have shown that free trade and globalization meant the absence of ethical and moral values, the absence of responsibility and accountability to products and people, abuses of human and Earth rights, cause for terrorism, social and economic injustice, poverty, and pollution. Ever since World War II, you have brought disgrace to humanity by your selfish, immoral, unethical, incoherent, inconsistent, dishonnest, erratic, and mostly aimed at making money behavior in the Middle East and towards Afghanistan. Like the rest of the world, China has understood the need of oil and gas for energy and the manufacturing of plastic products from oil and/or gas. Plastics are needed to keep China's economy going. That again explains why the United States government and you Mr. President are so keen in "winning the war" in the Middle East. Why leave the oil and gas to the Chinese people when you can just steal it. Why let China's economy grow by letting them have the oil and gas to make plastic products when you can steal the oil and gas and sell raw plastics to the Chinese people? Imagine! One billion Chinese people manufacturing all the plastic products the world needs. Americans wont need to work anymore! Well not quite! The few powerful and rich Americans and their corporations will be doing just fine. Most of the American people will be starving. No food because their soils has been degraded so much over the past decades that they can no longer produce healthy products. Furthermore, land will be used to produce plastic products for the few wealthy corporations. And you will have no water because by year 2010 your groundwater will have dried out. Most American people will wake up every morning with no healthy food to eat and no water coming out of the tap. Your vision Mr. President goes against primordial human rights, and we will fight you. Your vision of the world Mr. President is a world ending with the end of fossil fuels in 30 to 50 years down the road. In your vision, whoever will have the biggest guns at that time will survive. America is financially bankcrupted with a national debt of over 7.5 trillion dollars, an annual deficit well over half a trillion dollars, and America will never pay back the debt because they know it does not matter. At least it wont matter 50 years down the road. The world will be under tremendous natural and human stresses only 30 years from now. Money wont mean anything. You think guns will mean survival. That is the vision of America. It is their vision on how they want to survive and what they will do to survive. Again in your vision, democracy and human rights dont mean anything unless you belong with those who have the biggest guns. America's vision is completely wrong! The Global Community has a different vision of the world now and 50 years from now. Our vision in year 2024 is very much in tune with that of most nations of the world. Governance of the Earth will make the rule of arbitrary power--economic (WTO, FTAA, EU), political, or military (NATO)-- subjected to the rule of law within the Global Community. Justice is for everyone and is everywhere, a universal constant. The Global Community has no intention of changing the status and privileges of state governments. In fact, state governments become primary members of the the Global Community. Global governance can only be effective within the framework of a world government or world federalism. There is no such thing as global governance through the work of a few international organizations such as the WTO, the EU, or the United Nations dictating to the rest of the world. These organizations are heading in the wrong direction and are causing conflicts between nations, doing away with democracy, increasing the gap between rich and poor, and creating a culture of violence worldwide, terrorism being a small example of what they can do. The Global Community needs a global democratic leadership based on the Global Community and able to take responsibility and leadership, a stronger world order, more efficient and more democratic. Today, 65 % of the world population lives in democracies than dictatorships. This trend is increasing as more people want to live in peace. Because of a rapid transition to democracy, several of these democracies have not had time to develop strong democratic institutions and cultural changes. Many changes occur during a transition: written constitutions, legal reforms, multiparty elections, a free press, and an independent judiciary. But all changes take time to grow in people's new way of life. d) get rid of your annual deficit and pay your debt; we are doing it in Canada why cant you? j)	ratify the Kyoto Protocol and 'fight' for the protection of the global life-support systems. Your lives depend on them. On and around May 26 of every year millions of people around the world join together in a global call to celebrate Life, the gift to the universe from God. On May 26, 2006, Global Community Earth Government is asking all Peoples of the world to participate in this celebration of Life in your own community. The following project is appropriate to everyone. On May 26, as part of the Peace Movement of the Global Community Earth Government, the Human Family,we will be rejoicing with all Peoples of the world , and all life, for the annual Celebration of Life Day. Life is the most precious gift ever given by God to the universe and this event needs to be celebrated. We the Peoples of the Global Community Earth Government (GCEG), the Human Family, are reaffirming faith in the fundamental human and Earth rights, the Scale of Human and Earth Rights, in the dignity and worth of the human person, in the equal rights of men and women and of nations large and small. We the Peoples implies every individual on Earth, every community and every nation. Earth management is now a priority and a duty of every responsible person on Earth. GCEG has taken action by calling the Divine Will into our lives and following its guidance. Divine Will is now a part of the Soul of Humanity to be used for the higher purpose of good and life's evolution. We will learn to serve humanity and radiate the Will of God to others. Humanity welcomes the "Belief, Values, Principles and Aspirations of the Global Community Earth Government" (see the Global Constitution on our website) with Faith in the Divine Will and without fears such as the fear of change. Humanity seeks meaningful experiences and embraces the future for the better. Divine Will has caused the event of the Global Community Earth Government. Our time is the age of global cooperation and symbiotical relationships. There are many different kinds of symbiotical relationships. Symbiotical relationships exist between nations of the European Union. It is mainly an economic base symbiotical relationship. Other types of symbiotical relationships maybe created all over the world between communities, nations, and between people themselves. The GCEG, the Global Governments Federation, and the Global Government of North America are examples. They may be geographical, economical, social, business-like, political, religious, and personal. There has always been symbiotical relationships in Nature, and between Souls and the matter of the universe to help creating Earth and life on Earth to better serve God. 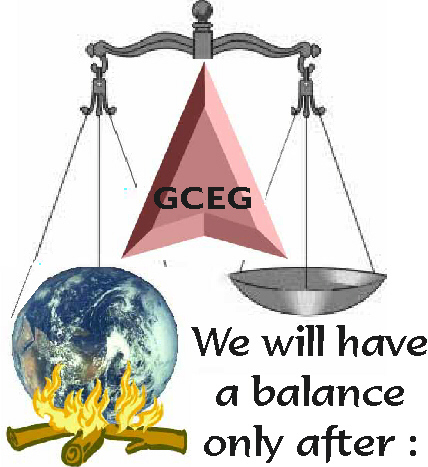 GCEG has begun to establish the existence of a meaningful global co-operation all over the planet. National governments and large corporations have taken the wrong direction by asserting that free trade in the world is about competing economically without any moral safeguards and accountability to peoples and the environment. The proper and only way is for free trade to become a global cooperation between all nations. Surely, if we can cooperate in fighting against terrorism, then we should also be able to cooperate in fighting against the effects of the type of free trade and the emergence of the planetary trading blocks as applied by national governments members of the World Trade Organization(WTO). It has already been shown (see Newsletters on our website) that these effects will be disastrous socially and environmentally and are a direct threat to the existence of life on Earth. GCEG is proposing a solution that the process of trading within the planetary trading blocks be changed from a spirit of global competition to that of global economic cooperation. This is the new way of doing business, the new way of life. GCEG has made clear that globalization and planetary trading blocks should be serving the Human Family and not the other way around, the people around the world serving the very few rich individuals. The September 11 event was the result of bad trading of arms and oil and the absence of moral responsibility and accountability in our way of doing business with the Middle East nations. By applying proper moral safeguards and accepting responsibility and accountability of all products (arms and oil in this case), from beginning to end where they become wastes, each corporation would make free trade and globalization serving the Human Family. The September 11 event was also a turning point in human history and indicated the end of the last superpower in the world and the birth of the GCEG. Over its long past history trade has never evolved to require from the trading partners to become legally and morally responsible and accountable for their products from beginning to end. At the end the product becomes a waste and it needs to be properly dispose of. Now trade must be given a new impetus to be in line with the global concepts of the GCEG. When you do exploration work, and develop, manufacture, produce, mine, farm or create a product, you become legally and morally responsible and accountable of your product from beginning to end (to the point where it actually becomes a waste; you are also responsible for the proper disposable of the waste). This product may be anything and everything from oil & gas, weapons, war products, construction products, transportation and communications products and equipment, to genetically engineered food products. All consumer products! All medical products! All pharmaceutical products! In order words, a person (a person may be an individual, a community, a government, a business, an NGO, or an institution) becomes responsible and accountable for anything and everything in his or her life. Global consumption is a very important aspect of globalization. Consumers should be concerned with the impact of their decisions on the environment but also on the lives, human and Earth rights and well-being of other people. Since one of the key functions of families as a social institution is to engage in production (selling their labour in return for wages) and consumption (using those wages to buy goods and services), then the role of families has impacts on sustainable consumption and development. Corporations are required to expand their responsibilities to include human and Earth rights, the environment, community and family aspects, safe working conditions, fair wages and sustainable consumption aspects. GCEG has summarized the rights of every person on Earth by developing the Scale of Human and Earth Rights. The scale will eventually be replacing the Universal Declaration of Human Rights. The Global Constitution established all rights. GCEG found that an adequate level of health care is a universal value as well as a human right. We expect adequate health services to be accessible, affordable, compassionate and socially acceptable. We believe that every individual of a society is co-responsible for helping in implementing and managing health programmes along with the government and the public institutions. is a criminal and considered extremely dangerous by the Global Community Earth Government (GCEG). Extreme caution ought to be taken for his arrest. A representative body of the Earth Court of Justice may be set up anywhere for his trial. Global Community Earth Government is asking you to surrender yourself to the Court. The same reasons apply here as explained to President George W. Bush. In general, populations of all lifeforms grow exponentially that is by a steady proportion of whatever was there before. When there is no practical limit on resource then populations usually grow maximally and the only limit is that of the reproductive capacity of the female animal. About 10,000 years ago, human beings were obliged to commit themselves more or less fully to agriculture and the human population was 5 to 10 million. Then about 2,000 years ago, after only 8,000 years of large-scale agriculture, the human population was 100 to 300 million. After this time, the exponential growth of the population entered its rapid phase. The billion mark was passed by 1800 A.D. By year 2000, the human population exceeded 6 billion. Thus agriculture allowed a thousand-fold increase in numbers over a period of 10,000 years. Obviously something has to be done! We propose a tight global policy, benignly implemented, or it will be very nasty indeed. In practice, a human population of 10 to 12 billion would be too uncomfortably high and would add a high strain on world resources. What kind of world population would be reasonable? What goal should we aim at? A population should be small enough to be sustainable indefinitely and still allow plenty of leeway for ourselves and other lifeforms. It should also be large enough to allow the formation of healthy civilizations. Comprehensive population policies are an essential element in a world development strategy that combines access to reproductive health services, education and economic opportunities, improved energy and natural resource technologies, and to healthier models of consumption and the 'good life'. We propose a world population of 500 million. In practice, if our proposal was accepted then the population would eventually fall. We would make all efforts to minimize infant mortality. We need to ensure that the women of the world who have shown an interest in the proposal of family planning would have access to all the help needed to achieve their goal. Contraception for men is also desirable. Participate in Global Dialogue 2006 to help humanity find solutions. Politics and Justice without borders. Theme: Actions for the good of all as per the Statement of rights, responsibilities, and accountabilities of the Global Community citizens. Beside the global warming of the planet, the human activity that affects Earth most is that of food production. We need to form a global ministry dealing only about agriculture and the protection of our soils. All nations will be part of the ministry. We have to design systems of food production that meet our own needs, and also leave room for these other lifeforms we want to take along with us. Western agriculture is designed in the end to maximize profit. As a primordial human right, the prime concern of the human species is to feed people. Therefore we have to do things differently. We will have to produce less livestock as we effectively double the population we need to feed: ourselves, plus the livestock that is supposed to be feeding us. We also have to apportion the land surface of the whole world more efficiently, using some for highhly intensive food production (which makes use of less land), some for extensive agriculture (combining food production with wildlife conservation) and designing some specifically as wilderness areas with global corridors between them. Hopefully this will help natives of British Columbia, Canada, and natives all over the world, to settle their land claims in their favor as they are the only people in Canada who can help protecting wildlife, at least for now. There should be a definite and specific clause in any agreement with the natives that it is what they will do with the land and not turn it into a huge industrial site as would the white man do. Global warming is certainly affecting the survival of these other lifeforms we want to take along with us. Climate change has always been a major factor throughout the entire evolutionary stages of life on Earth and will continue to be so in the future. We will have to make sacrifices not only for our own survival but also for all life on Earth. Changes now are far too rapid for these other lifeforms to adapt. They will have to tolerate us more to survive. Competition wil only be good when corporations, the business world, has accepted the new way of doing business and obtained the Certified Corporate Global Community Citizenship. 5. Thou shall banish war as a solution to problems between communities. All Souls involved with war, directly or indirectly, shall face the Soul of Humanity to be purified. All Souls involved in the making of weapons, war products and equipment shall be facing the Soul of Humanity. 9. Souls traveling the galaxies to propagate life shall be good Souls only. They shall still be a part of the Soul of Humanity. Their higher purpose shall be to spread life of various forms throughout the Universe.